Support staff provide a tremendous service to people diagnosed with autism spectrum disorder (ASD). Each person with ASD is unique, yet people with this diagnosis usually face challenges with social communication and using sensory information. In addition, it is typical for people with a diagnosis ASD to engage in repetitive patterns of thinking and behaving. In combination, these qualities often result in people with ASD becoming isolated and disconnected. Social belonging is a big part of enjoying life. Support staff often play an important role assisting people with ASD to engage more with the world around them and to develop a sense of belonging. Without training and support, however, it can be difficult to know how to do this. This course is meant to help you get started building a relationship provide support for socialization and integration to people with ASD. Your ability to make connections with people can be the first step toward greater social awareness and willingness to take risks in the outside world. 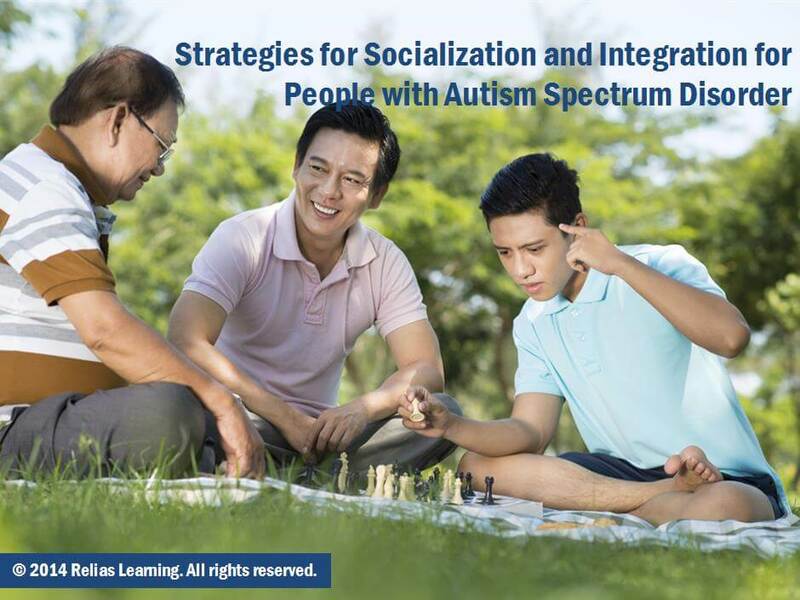 In this course, you will learn about some common social challenges faced by people with ASD and how you can support them working to build a meaningful place at school, work, and in the community. Identify common barriers to social relationships faced by people who have autism spectrum disorder. Explain how to get an interaction going with a person who has a diagnosis of ASD and why it is so important. Use a reflective practice to promote social connection and community belonging. Section 1: Introduction A. About this Course B. Learning Objectives Section 2: Social Value and Belonging A. Sorting Silverware: The Second Decade B. Sorting: A Different Approach C. The Turning Point D. Support for Social Interaction E. Common Barriers F. A Place for Everyone G. Drama Done Wrong H. Drama Done Better I. The Plot Thickens J. Reflective Practice K. Section Summary Section 3: Integration Through Interactions A. Getting an Interaction Going B. Persistence C. Check the Energy Level D. Calming Things Down E. Waking Things Up F. Joining In G. Making a Connection H. Inviting Engagement I. Identifying Barriers J. Complex Barriers K. According to Plan L. Billy and the Light Bulb Moment M. Building on the Interaction N. Section Summary Section 4: Individual Supports in Practice A. Meet Sheila B. Sheila, Fandom to Community C. Meet Robert D. Robert: Expert and Partner E. Support for Staff F. Section Summary Section 5: Conclusion A. Summary B. Congratulations! Dr. Joshua Feder is Director of Research, Graduate School, Interdisciplinary Council on Developmental and Learning Disorders, voluntary associate professor at UCSD School of Medicine, and medical director at SymPlay, teaching, advocating, and developing technology to support relationship-based interventions (joshuafedermd.com). Disclosure: Joshua Feder, MD has declared that no conflict of interest, Relevant Financial Relationship or Relevant Non-Financial Relationship exists. The target audience for this course is: entry, intermediate, and advanced level Direct Support Professionals; in the following settings: Intellectual Developmental Disabilities.